Treehouses truly epitomize the best of summertime adventure – with their nest-like architecture amidst the familiar surroundings of one’s own backyard. Regardless of where your family has decided to perch for the summer, there is no doubt that your little ones have the itch to let loose outdoors and scale new heights. Artist and builder Barbara Butler recognizes the value of ‘time spent in trees’ with her amazing, custom-built treehouses. Her playgrounds in the sky are made to last for generations, with the imaginative whimsy of everyday fun. These follies and designs encourage kids to climb higher, set sail, and cast their gaze out over exciting ‘green’ horizons. Add to this incredible mindfulness of our planet, the use of her own natural tung oil stains, site-specific integration, including a melding with existing vegetation and natural features, and you have an outdoor playroom that rivals any indoor addition you might add to your home. 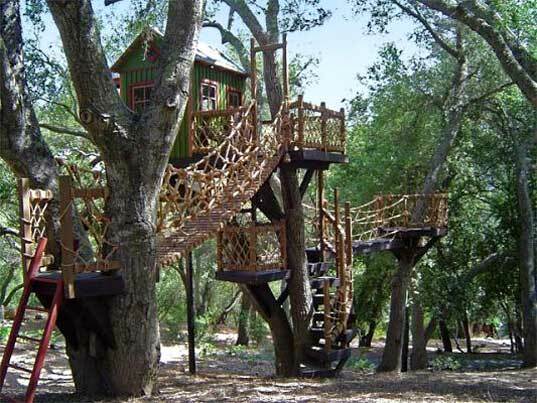 Butler has been building treehouses since 1987 – with an impressive client list that includes celebrities such as Robert Redford, Will Smith, Kevin Kline and Phoebe Cates. The designer also incorporates “rubberific” mulch – made from recycled tires – as the soft ground cover beneath her treehouses and play structures. Butler also recycles her designs by helping clients to sell or donate to charities when they move or when their kids grow up. They also bring the old structures back to their workshop, completely refurbish them, and then deliver them to a new locale. In my day, we basically cobbled together DIY make-shift treehouses out of recycled wood scraps and found materials on our family farm. But, given my leanings towards a Swiss Family Robinson lifestyle, I am considering a Barbara Butler design as a supplement to our eco-friendly compound. Treehouses truly epitomize the best of summertime adventure - with their nest-like architecture amidst the familiar surroundings of one�s own backyard. Regardless of where your family has decided to perch for the summer, there is no doubt that your little ones have the itch to let loose outdoors and scale new heights. Artist and builder Barbara Butler recognizes the value of 'time spent in trees' with her amazing, custom-built treehouses. 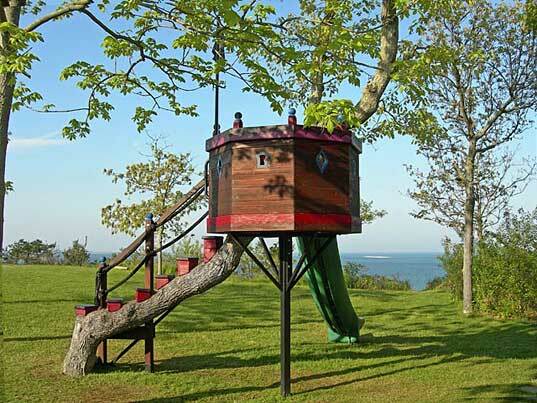 Her playgrounds in the sky are made to last for generations, with the imaginative whimsy of everyday fun. These follies and designs encourage kids to climb higher, set sail, and cast their gaze out over exciting 'green' horizons.